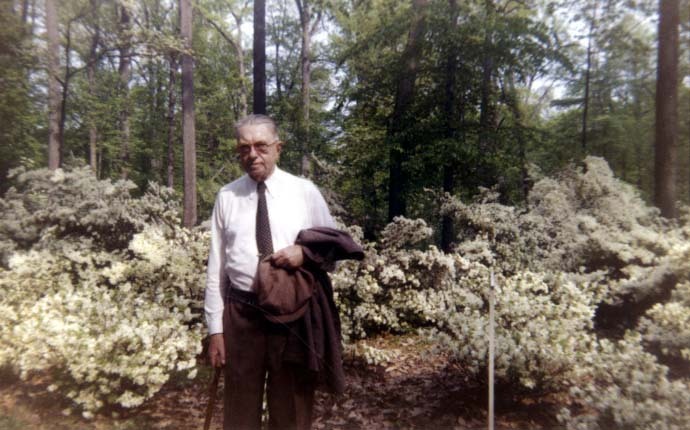 H. F. du Pont in the Azalea Woods at Winterthur, spring 1958. Winterthur welcomes the first day of spring with printed flowers in bloom! Visitors to Winterthur know that Henry Francis du Pont’s love of flowers and gardens extended to his collecting and decorating practices. In addition to displaying fresh flowers in many rooms at Winterthur, Mr. du Pont exhibited paintings, prints, and drawings of floral bouquets throughout both the museum and his later home at Winterthur, the Cottage. 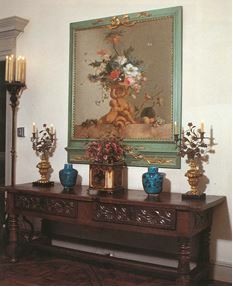 View of the Main Hall in the Cottage in 1994, showing a Dutch Baroque flower still life painting from the circle of Jacob de Wit (1695–1754), a follower of Jan van Huysum. Circle of Jacob de Wit, Putti supporting Baskets of Flowers with Birds and Fruit, on stone ledges. Oil on canvas, 52 x 46 ½ in. Sold, Christie’s, 1994. Although he selected these works solely for their decorative appeal, there is a rich historical tradition of flower imagery that is present throughout the collection at Winterthur. The floral still life genre dates to seventeenth- century Holland, a period known as the Dutch Golden Age. Dutch flower paintings functioned as decorative images, specimens for scientific investigation, and symbols of the passage of time. The works of Jan van Huysum (1682–1749), a leading Dutch flower painter, embody these functions. Van Huysum examined flowers closely so that he could paint them as naturalistically as possible. At the same time, his canvases were very imaginative, combining foreign and local flowers from different seasons in an artificially arranged bouquet. Throughout the 1700s and 1800s, European artists emulated van Huysum’s bouquets in paintings and prints, and many examples can be found at Winterthur, such as an oil painting inspired by van Huysum and watercolors painted by his followers—all created in the eighteenth century. Van Huysum’s works reached a wider audience through prints however. Two mezzotints at Winterthur represent van Huysum’s lavish compositions in rich tones and delicate surfaces, created by Austrian printmaker Johann Peter Pichler (1765–1807). Pichler probably saw the original van Huysum painting Flower Still Life with Bird’s Nest while working in Vienna as it hung there in the Czernin collection (today in the Scottish National Gallery). The printed bouquets seem to be growing wildly before our eyes, barely contained within the boundaries of the plate. The lush still lifes have meticulous botanical details, such as buds in all phases of bloom, gathered in vases decorated with classical nudes. Extravagant bouquets featuring different varieties of flowers as well as various insects and fruits made the exotic attainable for print consumers near and far. For instance, a number of prints after paintings by Dutch still life artist Pieter Casteels (1648–1749) were published in Britain in the mid-eighteenth century and collected as far away as the American colonies. 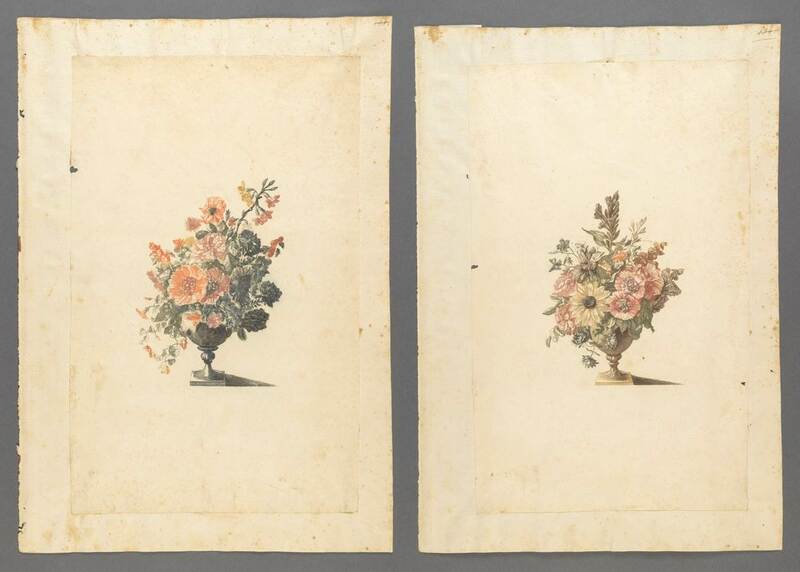 These prints commemorated the months of the year in flowers. Winterthur owns a full calendar set entitled Flora, published in 1745 by John Bowles to meet the high demand for fanciful flower pictures. The set of thirteen etchings featured one bouquet per month plus a title page introducing the pleasures of the garden. All of the flowers were labelled and grouped according to the month in which they bloomed. Some months included flora from America, which was as foreign to the British as the Dutch tulips that stemmed from the Ottoman Empire. Bowles’s bouquets were prized for both botanical accuracy and aesthetic invention, depicting elegantly curved stems, heavy hanging blossoms, and delicate sprigs of leaves in balanced yet asymmetric compositions. Most floral illustrations were printed in black and white, though they were sometimes hand painted after printing, such as in popular natural histories like William Bartram’s Travels from America. To show flowers in color not only recorded nature more accurately but also enhanced the aesthetic pleasure of looking at flowers in bloom. Printing in color would increase production and allow for potentially more vibrant colors. Two exciting, recent Winterthur acquisitions demonstrate a pioneering color printing technique applied to popular flower still life bouquets that were produced for public consumption. 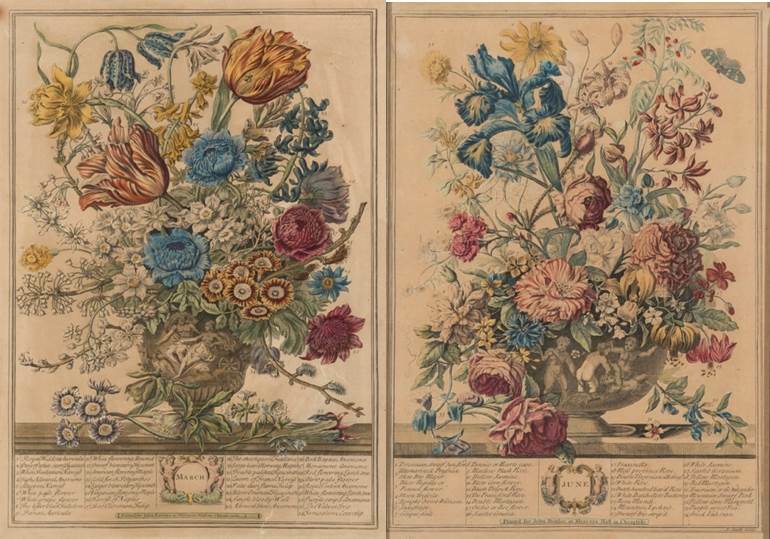 Two rare, late seventeenth-century Dutch color prints by Johannes Teyler and workshop, after flower bouquet designs by Jean-Baptiste Monnoyer. Johannes Teyler, A Bouquet in a Black Urn and A Bouquet in a Brown Urn. Etchings printed in colors à la poupée, 6 ½ x 4 ½ in., 2017.5.1-.2. Attributed to Dutch engraver and inventor Johannes Teyler (1648–ca. 1709), A Bouquet in a Black Urn and A Bouquet in a Brown Urn are etchings and engravings made with the innovative method of printing à la poupée, where colored ink was selectively applied to the printing plate. This effectively created “printed paintings,” as each impression was unique. These and hundreds of other prints produced in Teyler’s workshop represent the first flourishing of true intaglio color printing in the West. Like the printmakers who looked to paintings by van Huysum and Casteels, Teyler’s workshop of engravers and designers often took inspiration from existing European paintings. 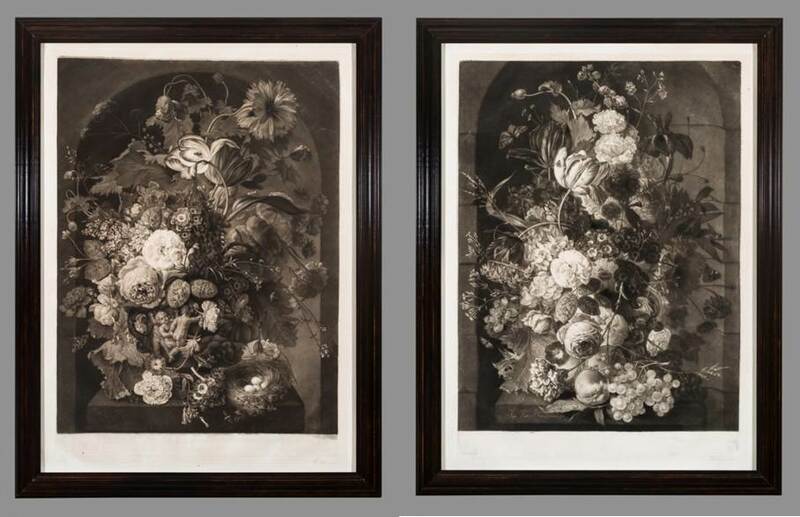 Winterthur’s prints were modelled after painted bouquets by Jean-Baptiste Monnoyer (1636–1699), a Flemish flower painter working in France whose compositions included alien and familiar flora. For example, the Black Urn contains a tropical pink mallow and a northern rose in shadow. Teyler’s exotic subjects, dazzling colors, and beautiful designs proved to have international appeal as his prints were collected during or shortly after his own lifetime by British statesmen. Many of the fantastic flowers illustrated here were recently digitized thanks to a 2016 Art Works Grant from the National Endowment for the Arts. Please enjoy these plush prints in our online database or in person at Winterthur, where you can also appreciate our blooming March Bank in the garden! For more floral-themed objects in the Winterthur collection, visit the Flowery Thoughts: Ceramic Vases & Floral Ornament exhibit on view in the Galleries at Winterthur. Fowble, E. McSherry. Two centuries of prints in America, 1680-1880: a selective catalogue of the Winterthur Museum collection. Charlottesville: Published for the Henry Francis du Pont Winterthur Museum by the University Press of Virginia, 1987, 224-227. Taylor, Paul. Dutch flower painting, 1600-1720. New Haven: Yale University Press, 1995. Turner, Simon. “Opus typo-chromaticum: The Colour Prints of Johannes Teyler.” In Printing in Colour 1400-1700: History, Techniques, Functions and Receptions. Eds. Ad Stijnman and Elizabeth Savage. Leiden: Brill, 2015, 196-206. This entry was posted in Academic Programs, art collections, Du Pont Family, House, museum collection, Paintings, Prints, Photos & Drawings, Uncategorized and tagged Dutch flower, Winterthur Museum Garden & Library. Bookmark the permalink.